Sunday morning, 11/5/06 @ 4:30am I woke up the wife to find she was not feeling well, and that meant I was on my own for the morning hunt. I was in the stand, just as it was breaking daylight. 45 degrees and the rut was on. A good morning to be in the stand. No sooner than I got myself settled in I heard a crash up above me on the hillside,,, very thick in there. I knew she was being chased by something, so I stood and grabbed olde "Two Snakes" with a firm grip, and knocked my best flying rivercane arrow that happens to be tipped with one of "Knife Rivers" flint tips. Here he comes nose to the ground and moving pretty fast down the same trail the doe was on. If he keeps coming he'll be about 15 yards from the base of my tree. Sure enough he come trotting by and I give him the olde "MAaa" with my mouth, and he stops dead in his tracks. by this time I'm at half draw and I pull back to deliver the shot. Dang it,,,, just as I release he bolts off after the doe.... To late, I have released and the arrow strikes him in the rear end about where the hip joint is. I knew this was not too good and I sat down cusing my luck,,,, again. I watched as he ran out towards a cow pasture that is about 100 yards away, and then I lost sight of him. I waited until 10:30am before I climbed down. I saw a coyote come accross the hollow and I was afraid if the buck had bedded the coyote would jump him up. So, I got down and started looking at the area where I had shot him. My hopes were that I had hit the femerul artery located in the rear haunch. If so,, he'd bleed out in no time. No blood on the ground at the point of impact, but a large clump of brown/grey hair. I new the arrow sunk in deep as I could see it sticking out as he ran towards the fence line of the pasture. 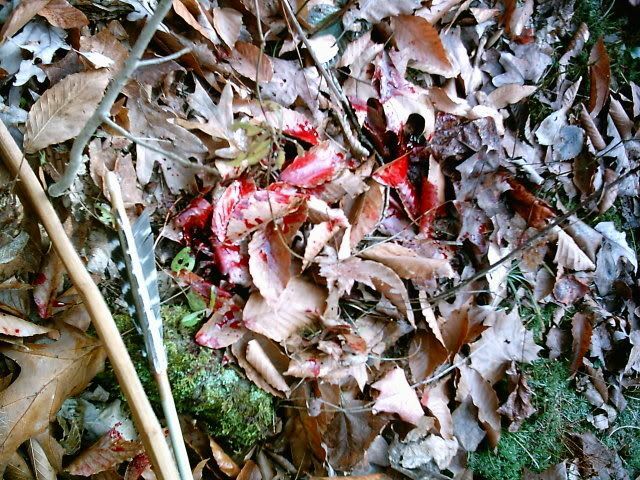 My hopes dwendled after about 50 yrds with no sign of blood. I though to myself,,, I've done this before and still hunted to the wounded animal and finished'em off with a follow up shot. 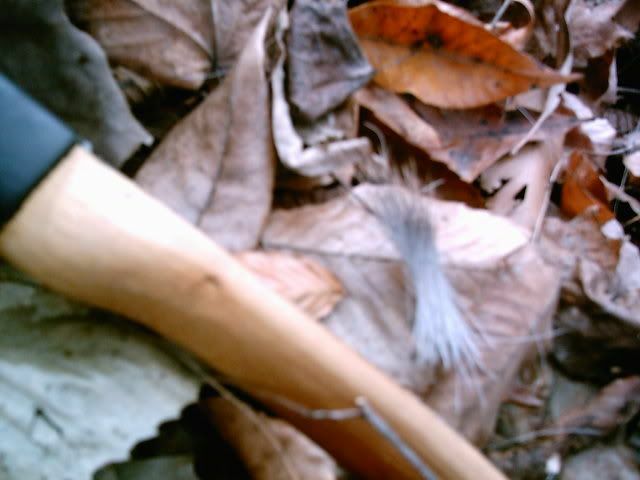 It was my only hope, so I started the still hunt in the direction of the buck’s departure. Then I saw a couple small specks of blood. I continued on to find more and thicker blood at about 75yrds. My hopes started to raise a bit... Then more and more blood. I thought to myself,,, If he jumps the fence and hits the tall grass in the pasture, I may loose the trail. Here at about 50 yards from the fence, I find a bed, but I was not sure he'd laid there or run over another deer's bed. After that the blood turned very spotty and I was getting concerned again. At the fence line, I lost the trail for a while and had to search pretty hard before finding a few small spots of blood that told me he did not jump the fence but followed the fence line up the hill,,, Not a a good sign at this point. I continued on to the top of the ridge. there I stopped and glassed the thicket in the hollow in the bottom of the other side of the ridge. Just as I gave up and stood up to take a pee,,, I hear something in the bottom. Dang it,,, there he is trotting out of the thicket and on to a small haul road. I gave it another half an hour and still hunted to the thicket to find his bed with no blood. I was getting sick by now! I slowly worked my way to the haul road and as I peak around the bend I see him standing with his back to me, and he is looking the other way. I figure, dang he's hurt bad or he'd be long gone. I'm 36 or 38 yards away and I don't want to take a "Hail Marry" at his buttocks,,, so I snap a picture. Note the small log at the bottom of the picture frame. I think if I can get across that log without spooking him I'll be about 30 yards away and I'm taking that hail marry shot. As I draw back olde Two Snakes,, I feel the wind change and it's blowing up my back and straight at him. He ain't standing for that and off he trots,, kinda awkwardly. I gave him a few minutes after he trotted off, and just for curiosity, I picked out a leaf on the ground where he had been standing just to see if I could have hit him as I had intended with the hail marry I was about to take. I only missed the leaf by an couple inches. I probably would have stuck him again, but to late at this point, he was gone again. When I got to where he was standing there was only a small puddle of blood, but I had gone close to 400 yards already and I was not giving up yet. 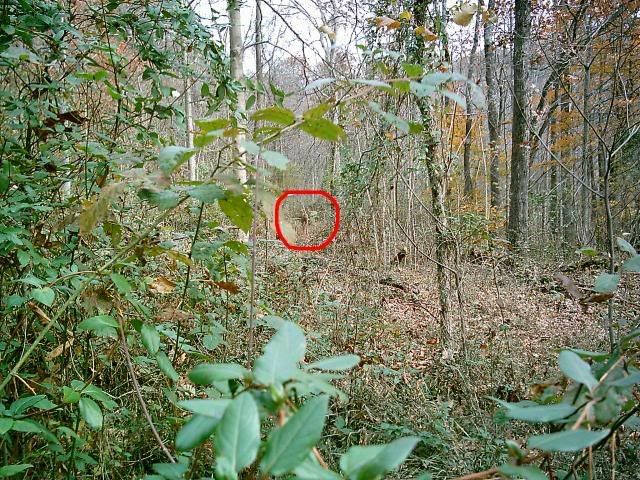 I knew he was heading for the open woods and if I speeded it up a bit I may see him crossing the next hollow. Sure enough, there he was stopped again in the open woods,,, he looked ill. I tried to move in on him again, but the wind was in his favor and he walked to a barbed wire fence line and crawled under the fence. he was heading towards a small thicket and I thought if I backed off he may bed there and bleed out. I left for home and got me a bite to eat. The wife was feeling better by 2:00pm and I told her she could sit in the stand while I looked for my deer. The incentive for her was I might run something past her while looking for my wounded deer/buck. So she agreed to go back with me. When we pulled into the farm,,, the land owners Son's truck was there and I knew he had come to hunt. Not wanting to mess up his hunt looking for my deer I decided to hunt with the wife in a double stand we had place earlier in the year. I hate to admit this, but while we hunted that stand, we had a huge ten point come by at 20yrds,,, Well, unbelievably we both go shots at it and we both missed it. 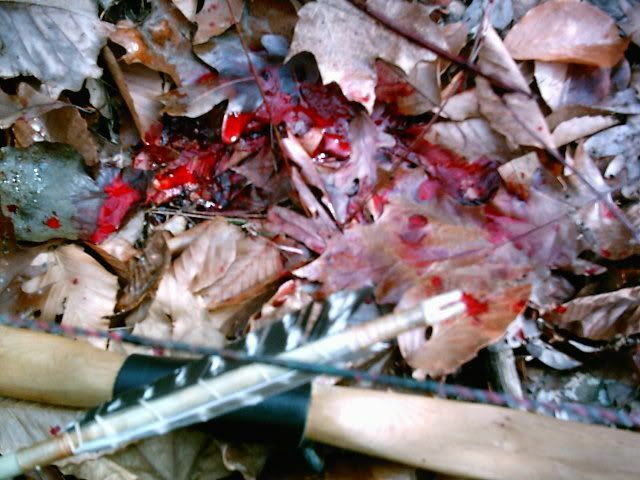 My shot was a clean miss by an inch under the vital area and her shot hit a limb that sent both the buck and her arrow flying way up into the air. At dark we headed for the jeep. We ran into the land owners son as he came in on his ATV. 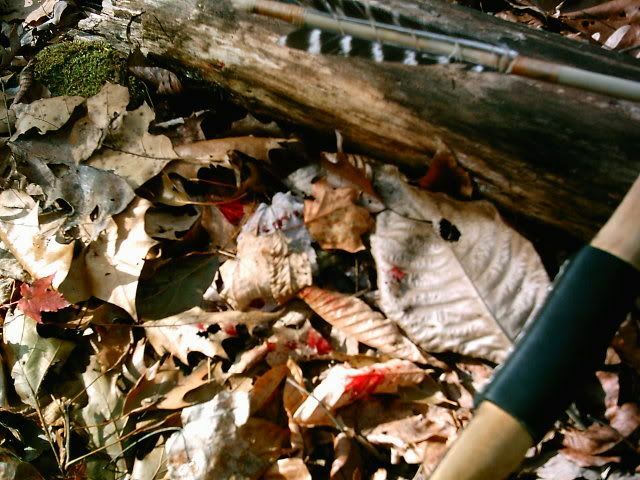 He stopped and asked me if I shot flint tipped arrows with that funny looking bow I was carrying. I said it is a selfbow and I shoot rivercane and flint arrows.... 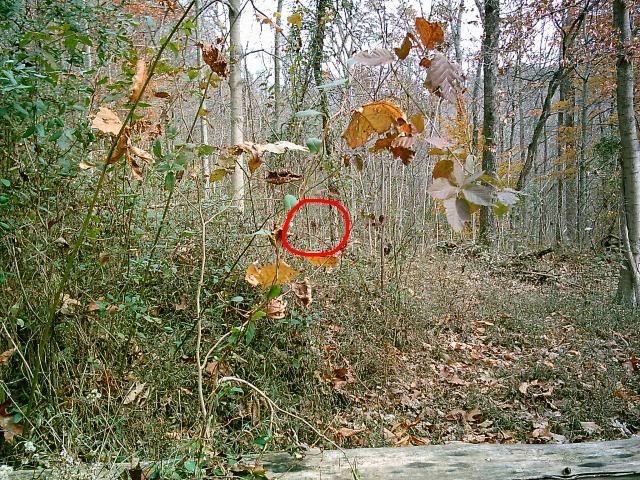 He then handed me the arrow I shot the buck with that morning and said,,, your buck is laying about 50 yards the otherside of the barbed wire fence. I was elated and then he offered to help me go get it. Well that is how it all came together. And with all the up's down's and up's again that day,,, it's one day I wont soon forget. Congrats Joseph, VERY SWEET deal.
" If I fail trying my hardest did I really fail ? " Way to go Joe.....Your thread has been an awesome contribution to TG....I just knew it would end like this!! have enjoyed and learned much from your thread. 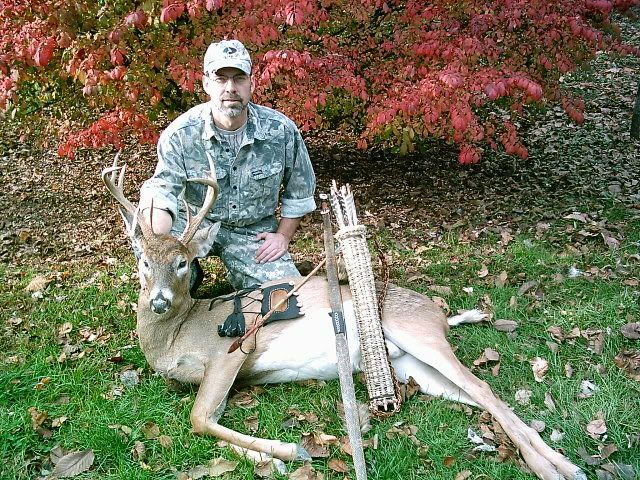 congrats on a fine buck! Very well done Sir.......tip of the hat and more. I'll archive your thread soon.